The Swaziland Government is panicking after an internal memo saying that salaries of public servants could not be paid this month and would be delayed by about two weeks was leaked yesterday (11 November 2011). The memo (pictured), sent to the secretary to cabinet, all principal secretaries and all heads of department, got into the hands of pro-democracy activists and within hours the international news agencies AFP and Reuters had published the news. Then the Swazi Government at first refused to confirm the memo existed and then hastily convened a late-night press conference to say the memo had been published in haste and the Cabinet would discuss the matter on Monday. 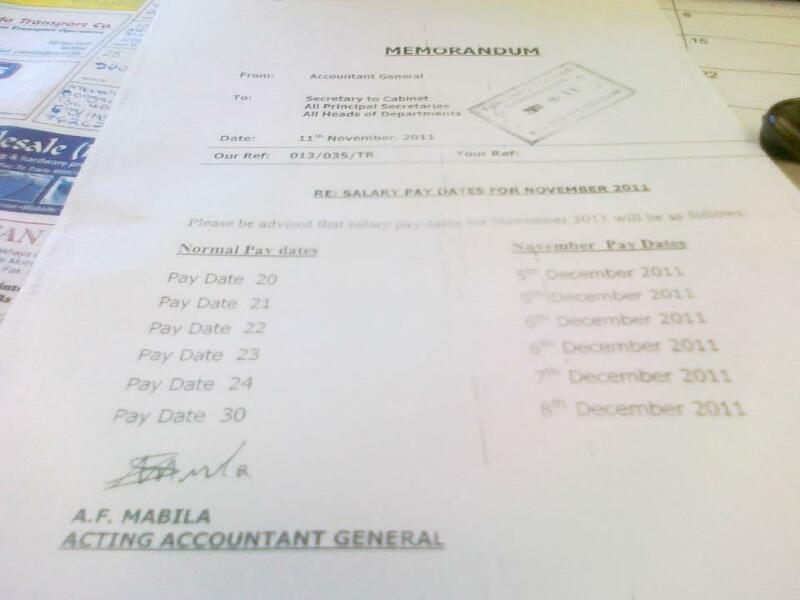 The memo signed by Fikisiwe Mabila, the Acting Accountant General, said that salaries that should be paid on 20 November 2011 would be paid on various dates from 5 – 8 December. The memo gave no reasoning for the delay, but it comes days after Majozi Sithole, the Swaziland Finance Minister, admitted that there was not enough money to government salaries this month. About E350 million is needed to pay the salaries. This is as a result of the meltdown in the Swazi economy caused by years of financial mismanagement by successive governments handpicked by King Mswati III, sub-Saharan Africa’s last absolute monarch. Once news of the memo became public yesterday, Percy Simelane, the government spokesperson, refused to confirm its existence. The Weekend Observer reports that he said he had not seen the memo, but had heard about it on the ‘grapevine’. Then Sithole called an impromptu press conference last night withdrawing the memo, saying it had been issued in haste and that the cabinet would meet on Monday. The fact that state-controlled radio SBIS had by then run with the story on its 6pm news bulletin suggests that the memo did have the official backing of government. The station is not known for its independent journalistic endeavour and it is inconceivable that it would have made the report without official approval. The swift U-turn by the government came after angry reaction from union leaders. In a statement published in the Observer today (12 November 2011) (NAPSAWU) said there was no doubt that the news would lead to civil disobedience in Swaziland.